The official word is: There is no 200th Street in the Bronx or Manhattan; Manhattan numbered streets skip from West 196th Street straight to West 201st. 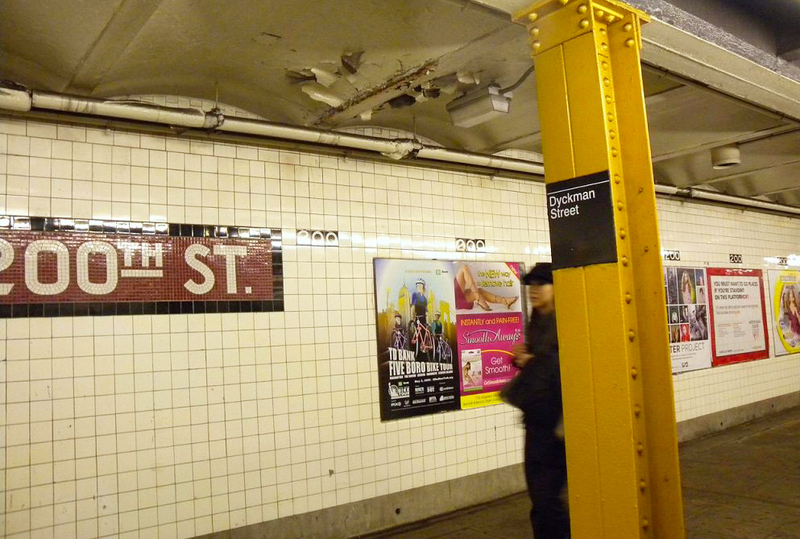 But if you happen to be passing through the Dyckman Street station on the Eighth Avenue line, you wouldn’t know it. What’s up with the phantom 200? There’s some speculation, but it seems no-one really knows what the construction crews tasked with finishing the station when the 8th avenue IND Subway reached Dyckman Street on September 10th, 1932 may have been thinking. Forgotten New York suggests that a surplus of tiles used for station ID plaques is the answer. But the station is the only place you’ll find 200th Street in Manhattan. The Bronx is a slightly different story. East 200th Street in the Bronx did, in fact, exist, in Bedford Park–if only for a moment in time. Maps from 1900 show East 200th Street where today’s Bedford Park Boulevard is. Apparently, 200th became BPB by 1906 (For what it’s worth, Bedford Park, Bronx is named for Edward Thomas Bedford, one-time president of the Bank of the State of New York). According to the New York Times, a young graduate student began a campaign in 2006 to reinstate 200th Street in the Bronx, both to honor history and because the address actually does exist in the postal service. Therion Troup began a campaign to have 200th Street restored as a supplementary name to Bedford Park Boulevard–similar to how Sixth Avenue street signs began to replace Avenue of the Americas in 1984. “With the New York Botanical Garden and other places using 200th Street, this would help people to actually find 200th Street addresses.” We don’t know whether this actually happened, however. Do you? Let us know!